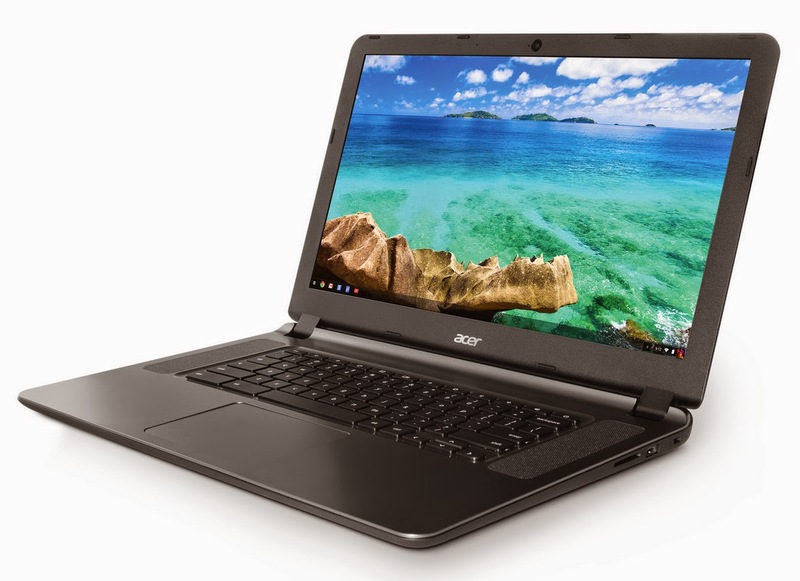 After launching the Acer Chromebook 15, the industry's first Chromebook with a 15.6-inch display, Acer today expands this line with a new model, the Acer CB3-531, available at a wallet-friendly price of only $199.99. The new Acer Chromebook 15 features 11.5 hours of battery life, the longest in the industry's 15-inch Chromebook segment. According to the latest data from Gartner, Acer Group is currently the world's leading Chromebook brand with over 36 percent market share in 2014. The Acer Chromebook 15 CB3-531 has a large 15.6-inch LED-backlit TFT LCD display that delivers a productivity boost since customers have more room to enjoy video, apps and tabs. Plus the new Chromebook's display features Acer ComfyView anti-glare properties to minimize the amount of reflecting light for less eye strain and fatigue. The HD 1366x768 resolution ensures that customers can comfortably enjoy content. The two full-sized upward facing speakers deliver increased volume and exceptional audio clarity. Plus, the built-in web cam supports High Dynamic Range imaging for clearer photos and brighter video chat experience. The new Acer Chromebook 15 CB3-531 provide extra-long battery life of up to 11.5 hours so customers can use the device for all-day fun, or productivity at work or school. The Acer Chromebook 15 is powered by the Intel Celeron N2830 dual-core processor and has Intel HD Graphics to provide a responsive experience. The 16 GB eMMC storage provides fast saving and accessing of data. The Acer Chromebook 15 CB3-531 keeps customers connected whether they're streaming video, browsing websites or catching up on email. The Chromebook includes fast MIMO 2x2 WiFi 802.11ac wireless connectivity, which is up to three times faster than previous generations. The new CB3-531 model in the Acer Chromebook 15 features the same reinforced design as the premiere models in the line. The case can withstand up to 60 kg of force, while the corners have been fortified to tolerate up to 45 cm drops without damage. These design enhancements translate into greater strength and reinforcement to endure bumps and drops. The textured granite gray surface of the CB3-531 is comfortable to hold and ensures a secure grip when moving around the home. Plus, the Chromebook can be easily moved since it weighs just 2.0kg (4.41 pounds) and measures only 383w x 256d x 24.2h mm (15.08w x 10.08d x 0.95h inches). The Acer Chromebook 15 line features the largest touchpad of any Chromebook today. As a result, customers will have a better overall experience and greater flexibility to zoom, scroll and navigate around the device. Also, customers can connect other peripherals to it via Bluetooth 4.0, the USB 3.0 port, USB 2.0 port and HDMI port. The SD/SDXC card reader accepts cards up to 128 GB in capacity. The Acer Chromebook 15 is great for a range of customers who view, edit, create and collaborate both on-line and off-line in programs, such as Office documents and Gmail. Chromebooks are simple to use and ideal for sharing by multiple users, since users can log into their own account to access Docs, website bookmarks and other information. Storage on Google Drive(5) protects files, documents, and photos safely in the cloud, and ensures that the most current version of the file or document is always available and safe, even if the Chromebook is lost or stolen. Security is a key benefit of the Chrome OS, as it's automatically updated to guard against ever-changing online threats. In addition, the Supervised Users feature helps get children online in a safe, controlled way. The new Acer Chromebook 15 CB3-531 will be available with 16 GB of internal storage and 2 GB RAM. The new Chromebook will be available in North America starting in July at prices starting at $199.99. It will also be available in EMEA starting in June 2015 at prices starting at €249.